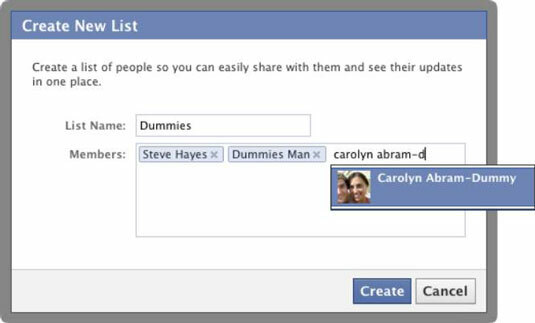 Facebook Smart Lists can usually help you figure out whom you want to share your own posts with. But sometimes you may want a specific list that Facebook can’t figure out. This might be a sub-sub-group, like all the people you played Frisbee with in college. In these cases, you can create your own list. From the Home page, look on the right side of the page for the News Feed menu. Click the down arrow to expand the News Feed menu once and then click the See All link at the bottom of the menu to expand it even further. This brings you to a list of all the different ways you can view News Feed, including seeing only certain types of stories or only stories from certain lists. Click the Manage Lists option (the last item in the list). The Manage Lists page appears. In other words, a page that lists all your lists. Click the Create List button in the upper-right corner. In the List Name box, type the name of your list. Maybe something like Dummies for the Dummies Team. Add friends who belong on this list by typing their names in the Members box. Facebook autocompletes as you type. Press Enter when you highlight the correct friend’s name. Now, wherever Friend Lists appear on Facebook, including where you set privacy, you have access to the new list you just created. Friend Lists you create are private, so even if the list you’re messaging is known in your mind as Annoying Co-Workers, all that your annoying co-workers see is a list of names. Members of Smart Lists are able to see the name of a list they’ve been added to.